Kenbak computer (claimed to be one of the first personal computer – 1971) has come back from the shadows of the past. I’d been thinking for a while that emulating an old-school switches-and-lamps computer would be a fun Arduino project, but had stalled looking at things like the Altair 8800 with its 30+ lights and 20+ switches. 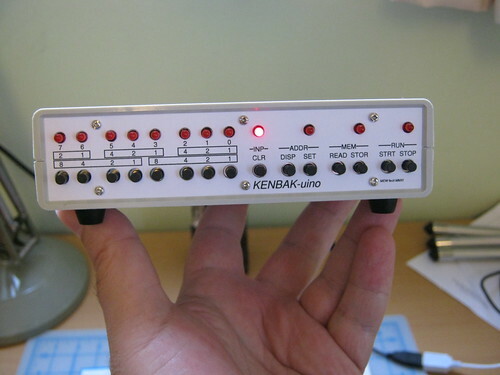 However, when I stumbled upon the Kenbak I thought it was something I could pull off as my first real Arduino project. Naturally I called it the KENBAK-uino. This is the end-product, it can be programmed via the buttons on the front panel and show outputs on the LEDs. It’s a faithful emulation of the original CPU but with a few enhancements thrown in like pre-loaded sample programs and access to a real time clock. via flickr (set), (videos) (code).